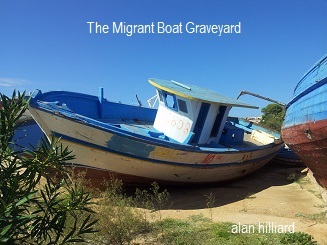 Migrant’s graves in Lampedusa..no names just a number…. We stopped off in Sicily to meet some people who had made their way from Central Africa to Europe. Lampedusa is only one port that receives refugees and migrants. When boats are intercepted they are brought to many different ports in the Mediterranean. When they arrive the people are brought to detention centres until they are given status if they can prove they are refugees seeking asylum. If they are deemed to be economic migrants they are usually returned or ‘repatriated’. I met Abraham. He was fifteen when he left his country. He is now twenty years of age. When he was in his homeland he witnessed a murder of someone he knew. The killers were convinced he’d retaliate or inform so they put a price on his head. His sole relative at that time was his grandmother. Before the murder occurred he made friends with an older man who had spent time in Libya, this man was friend of his father who died when Abraham was in his mother’s womb. Following the murder Abraham decided that he had to leave his village and his country if he was to stay alive. His father’s friend had also decided to travel back to Libya and volunteered to fund Abraham’ journey. They would travel together. The first part of the journey from his native country was traversed by bus but there was no way he could cross the border as a minor without his father and mother. Abraham and his friend had to get off the bus and travel by land across the border to avoid capture and detention. Once across the border the negotiations with the traffickers began. His friend did all the deals. The plan was to get to Libya and the traffickers promised that they’d get them there. They were loaded into a truck and headed deep into the desert. Days and nights passed until the driver stopped and he instructed everyone to get off they truck explaining that he had to go for petrol. They protested asking where he could get petrol in this place however, you cannot argue with men with guns. They had no water and no idea where they were. The cold at night was as intense as the heat during the day. They travelled when they could hoping they were heading in the right direction. Eventually another group of traffickers arrived and began to negotiate with them. Abraham was taken to one side and a gun was put to this head. The traffickers were going to use him as an example and were ready to kill him. If the other people in the group did not pay money they would be killed. His friend volunteered to pay so they took his money and then shot him but Abraham was allowed to live. His great friend who had taken him so far, feeding him and negotiating on his behalf was now lying dead in front of him. The remainder of the group was taken to another location where they were locked in a shed. They were continuously beaten and guns were put to their heads in a threatening fashion. The traffickers used mobile phones to contact the family members of those who were locked up trying to extort money from them. If no money was forthcoming they were killed. Astonishingly the traffickers kept their promise to Abraham. He was brought to Libya and was kept for a long time in a detention centre with adults from many different countires. Many local people visited the centre to bring food and clothing to those who were held there. One day a man who came to visit on a regular basis spotted Abraham and asked him how old he was. He was quite shocked that one so young was in this place and he arranged to take him to his own home to live with his family. Then the war broke out. This man was a political associate of Colonel Gadhafi and as the war intensified it became clear that his life was in danger, his mother had already been killed. Abraham foster father advised him to get out of the country. Abraham saw the NATO reconnaissance flights during the day and saw and heard the bombs fall at night. Migrants were rounded up and put in areas to act as human shields. One night the ground shook from the bombs that dropped around him. Soon after this soldiers came to the building where they were kept. Many were ordered out at gunpoint and placed on trucks. As they left all their paper work was taken, every pocket was checked and they were left with only one tee-shirt and one pair of trousers. They were driven to the harbour side and put on a boat with no water and no food. There was one thousand and five people squashed on board a fishing boat. This boat and others like them were used as human shields to hamper the navy offensive and to discourage shelling and the use of torpedoes in the area. It didn’t take long to realise that the man who was put at the helm of the boat knew very little about navigation. They were basically pushed out onto open water with no guidance or assistance and with no skills set to help them find their way to a safe haven. They were war fodder. For three days they headed off into uncertainty until they came across a fishing boat. They shouted for assistance and even for water but the skipper of the vessel just told them to move on and not to be annoying them. Abraham could tell from the flag that it was an Egyptian vessel. Because people rushed to one side of the boat the bow boat rose up and fell down again into the water. This sudden motion caused many on board to be thrown into the sea. The man at the helm was crying as he tried to manoeuvre the boat back to collect those who were drowning but he wasn’t skilled enough to navigate a course. The fishing vessel disappeared. A day later they were met by an Italian Coast Guard vessel that guided them to a safe haven. Over a thousand people on open water for four days without food or water until they met this ship. Abraham was detained in a migrant centre for two weeks until he was moved to a juvenile centre. He received basic training and was given work in a hotel. At twenty he went back to secondary (high) school as his childhood schooling was non-existent. He sits with teenagers who are five years younger than him; some are racist towards him sending inappropriate texts. He works every morning from five a.m. before he heads to school. He works after school, he does his homework and he gets extra study support to help him understand the some of the more complex subjects. I asked him about his understanding of God. He said he could not have made the journey without God. Every day he wakes up the first thing that comes to his mind is God; every time there is a problem he knows God will sort it for him. He explains that whenever he thought the end was nigh, God always sent some one along to help him. He cannot understand how a world can live without God. ‘Where in the world would you most like to live?’ I asked him, ‘wherever there is peace’ was the immediate reply. His prayer is always for peace in the world, he cannot understand how people who say they believe in God are at war, ‘peace is God’s way’, he said. Spontaneously he said that he thinks Papa Francesca is a man of peace and a man of God whose words will last for thousands of years. When he reads what his hero says he feels so blessed and is awe of the man who speaks from God with such authority. Every day and sometimes twice a day he looks up Papa Francesca’s Facebook page to see what is saying. Abraham considers Papa Francesca to be a man who is a leader for all faiths. Abraham, he should know, after-all he is Muslim! Borders have been around for a long time. In the past they were predictable and defendable now they are appearing in the most surprising and unexpected places. Talking to people who have worked with those who arrived in Lampedusa was a very humbling experience. The overall sense they had was one of their short-comings, of not doing enough no matter how much they did. One word I heard over and over again in Lampedusa was ‘occhi’. It is Italian word for ‘eyes’. Looking into the eyes of those who had just arrived was personally challenging. I also heard deeply the frustration of those who tried to help. ‘Being among them I felt a pain driving though my heart…I could see fear in their eyes and they were so close to me… they were shaking from the cold weather and the fear…they seemed lost ..they were not demanding…they asked for nothing…some of them were just crying because they were split from the rest of the family…it was just about feeling with them…you are powerless…you are just a piece of a very big mechanism…bigger than you’. Looking into the eyes of the person who arrived after a hazardous journey was difficult but not as difficult as trying to look into the eyes of the systems that have been created around those who are moving across our globe. There is no doubt that people who looked into the eyes of these migrants were transformed by their helplessness, their fear, their undemanding presence and the pain of women holding their children but they spoke of rings of military wrapped around migrants even on ferries. In these situations individuals were writhing in pain or just needed to use a bathroom but they weren’t allowed. No one judged the military because they have to do their job however the operation need not be an entirely military one. Sadly this is emerging as the primary emphasis today and maybe this is the way it has to be it has to be for many reasons that some of us many not understand fully. However, European decisions makers do not necessarily have to compromise on the humanitarian dimensions of the crisis and the basic needs of those who arrive. Sadly, the borders we are creating now are not just on extreme geographical locations but between people. Welcoming the stranger and loving your neighbour now needs a permit, a permit which disempowers you because you are not allowed to say unsavoury things or make comments on human rights infringements. We heard of the United States Military embedding journalists during the war in Iraq and Afghanistan, we have got to the stage now that those who want to offer a cup of water are facing borders that vary in their penetrability. Isn’t it strange that looking into the eyes of another is so counter cultural and a threat to prevailing systems? Its not that strange really. Ed Ayers who was nominated for Pulitzer Prize for History once said that in order to cope with the issues emerging in our world today the general pattern of behaviour is that we will be encouraged to become a more blinkered people and less focused on the heart of the crisis at hand. 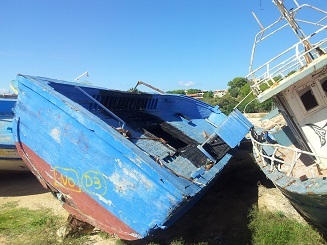 There are ongoing changes in the management of the whole migration system that a place like Lampedusa witnesses over the years. From the perspective of the locals many have seen a gradual shift from the tender welcome of a local fisherman to the emergence of a vast military operation. Migration and specifically the management of migrants has become a vast industry. We often hear about the outrageous sums of money that traffickers make from migrants but there are now enormous businesses involved in security and detention whose budgets and profits are increasing at the expense of the public purse. We are all too aware of this in Ireland following various investigations into Direct Provision Centres whose owners now do not have to file accounts. In Ireland today little is known about the plan for the resettlement of refugees. There is no evidence that the larger community is welcome to assist with the task. This goes against the principle of integration which states that all integration is a two way process between the long term settled and those who are newly arrived and the less interaction between both groups the more damage is done to the integration process thus damaging the overall cohesion of society. We have many people who are willing to help and support those who are arriving. Their energy needs direction; it will be good for everyone. 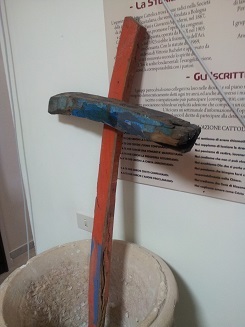 One of the people we met in Lampedusa told us of how she understood the mission. Relating to a story of Jesus in the Gospels she said that when the crowds came to see him it was often the disciples that rebuked him. Those who came from the surrounding areas knew his power and they longed for him to look into their eyes and make them whole again. This is not unlike today where those who have been given authority are often becoming a barrier or constructing borders between those in need and those who have something to offer. Another person described one particular occasion when she was bending down to give water to many who were seated on the harbour side. It was a particularly hot day in mid-July. The water they were giving out was warm and not very refreshing. When this person bent down to help people drink from the bottles a cross that she was wearing was hanging from her neck. Despite their great physical thirst many of the migrants reached past the water to touch the cross. This moment underlined for her that the people who made the journey across desert and water hunger for something deeper. 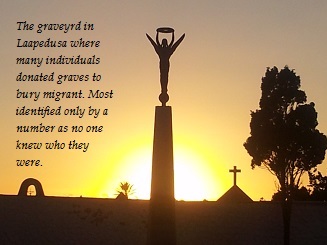 One person that I met described Lampedusa as a life-raft for the migrant. A life raft as you may well know is a small craft equipped with emergency supplies which is launched from a bigger vessel when the larger ship is in danger. The island measures just over twenty square kilometers and is therefore slightly bigger than Inis Mór which is the largest island of the Aran Islands lying off the west coast of Ireland. The total area is just over nineteen square kilometers. 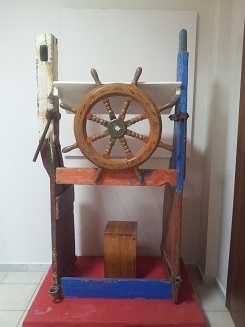 The image of a life-raft is appropriate as most other countries or regions in southern Europe could be compared in scale to fishing boats or luxury liners. Comparatively speaking then Lampedusa is indeed a life-raft. The island has a long history of welcome. Locals tell stories of people from Tunisia making their way to the harbour as many as twenty years ago. The locals knowing that these people had made a long journey would bring food and drink to them in the harbour. A fishing community is less concerned about security and it is more concerned with the well-being of their fellow fishermen. Some of these people used Lampedusa as a stepping stone into Europe not unlike the way many Irish people found ways to get into the United States illegally over the decades preceding 9/11. In summary then Lampedusa has an ethic of helping those who arrive. They do not want to be hailed as heroes because as they say ‘this is just what you do’. Those who work on open seas know that while others have the luxury of arguing over what is right or wrong or who should or shouldn’t be rescued a fisherman when he is alongside someone in the water knows that you have the choice of letting that person live or die. Furthermore, being fully aware of the hazards of the sea, they know that no one would willingly get in a crammed makeshift boat, especially women with children, unless they were leaving behind a life that was unbearable. In every sense then this little island is a life-raft which gives initial and limited comfort to refugees and migrants as they make their way to the larger vessel we call Europe. Each and every person who arrives lives with the hope that they will be permitted aboard. 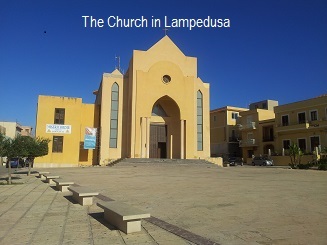 Lampedusa takes its name from the Italian word for lamp which is lampada. A guide told me that an eleventh century source relates the story of a hermit who was the sole occupant of the island. The lantern he carried at night brought many to safety. He lived in a system of caves which lay above a safe harbour. He took time to check the origin of the ships that were arriving. Some were Christians returning from the crusades, others were North Africans who traded with Europe. He had two caves set aside for worship, one was Christian the other more suited to Muslim prayer. Depending on the ship he made ready the space appropriate to the crew. The welcome was respectful and it ran deep. Unlike the past, the welcome of the fisherman is not the norm for those who arrive. The harbour has one wall which is a military area. This is where the refugees and migrants are landed. It is a secure area and only those with permits are admitted. Those who are fortunate enough to get into the compound can offer assistance to those who have been taken off the boats further out at sea. They speak of the fear in the eyes of those who arrive. 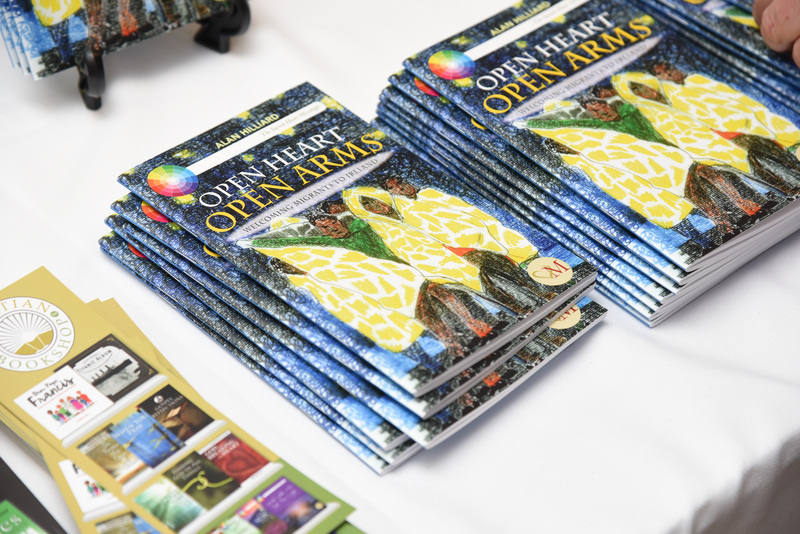 Not sharing their language means that they cannot hear their story; not sharing their culture often means you cannot offer a tender touch or hug. The sickness of those locked below due to engine fumes, salt water and human excrement leave them dazed and forlorn; those who look after them feel that they do not do enough. Both those who are above deck and below are parched with the thirst, dehydrated and unwell. Medical examinations mean that men and women have to lift clothing which makes it embarrassing for those who are present to offer help. Having heard many of the stories surrounding his visit to the island I think that in many ways Pope Francis’ visit to Lampedusa was a life-raft for him. His visit to the island which is seen as a life-raft for many migrants, allowed him an opportunity to give an important expression to his vision for the Church. Never in the history of the Vatican has a Papal Visit been organised in eight days. He didn’t go through the local Bishop but his intentions were made known to the local clergy. Word filtered out because staff in the airport were told a special flight was arriving from Vatican City. They figured this wasn’t to promote tourism to the Vatican Museum! There was no time to organise a grandiose altar or lectern; even seating proved to be a challenge. Some have said that he was so eager to visit the island that he had set about booking his own ticket on the internet before the Papal Household staff took him seriously. He made it clear that this was not an event for officials or dignitaries and let it be known that local bishops were to be busy in their own dioceses that day. 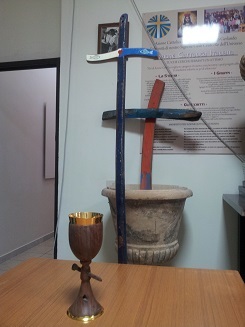 A local carpenter made a wooden chalice from a boat from which many were rescued but sadly on which three people lost their lives. The lectern from which Pope Francis asked us to ‘beg forgiveness for our indifference to so many of our brothers and sisters’ was made from boats, some of which carried migrants to their hope filled futures and others were from the timbers of boats on which many died. The Bishop of Rome travelled to Lampedusa to show that the Church must be a voice for the voiceless and a voice that inspires local gifts and talents for the service of others. He had just taken over the helm of the Universal Church, some might say the Church in Europe was loosing it’s course and was heading for the rocks. He got down from the heavy and awkward barque of Peter and stood among the people of the island of Lampedusa, an island that is recognised as a life-raft of opportunity for people on their way to Europe. In simple gesture of solidarity he held a lamp of opportunity before us all. This lamp casts a light that leads a way for members of the Church and members of the larger human family as we all seek to find a more even and secure route through the stormy waters of our contemporary world. Ps the carpenter who the chalice for the Mass made a chalice for me from the wood of one of the boats. I pray and hope that I am worthy to hold it.